How often are you just about to put the final coat of finish on a finished project, only to find the under layers are pitted and pocked like the surface of the moon? Just because we can’t see the dust settling doesn’t mean it isn’t there. Dust collection is incredibly important for woodworking, no matter what size the shop is. In fact, dust collection is even more important for smaller woodworking shops than larger commercial operations. Those shops usually have an advanced filtration system already in place. Whether you’re installing a dust collection system for the first time or upgrading your existing system, dust collection system design is essential to make sure fine dust and grit doesn’t fall through your fabric filter! Fine dust and other woodworking residue aren’t just bad for your stains and varnishes. They are also a health hazard. The United States government added fine dust to their list of known carcinogens in 2002. 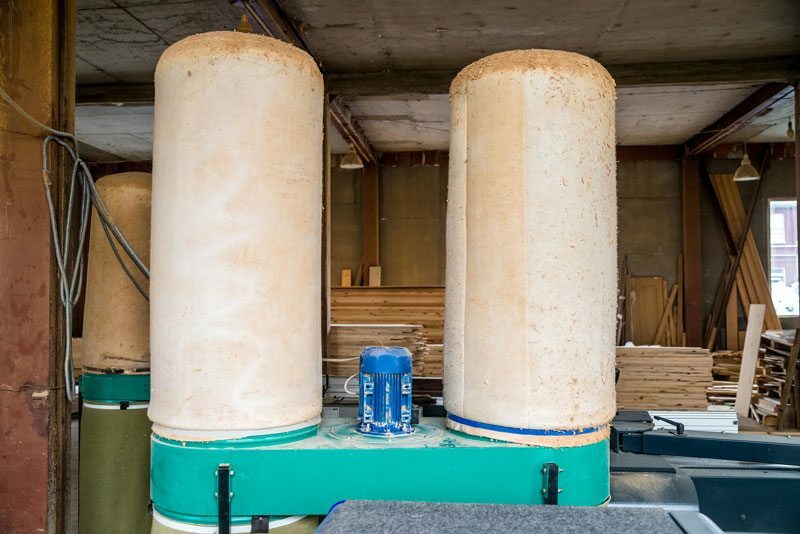 If you’ve been putting off upgrading or installing your dust collection system, don’t wait any longer! Woodworker and researcher Bill Pentz waited a little too long, thinking he was safe in a sterile workshop. Unfortunately for Bill Pentz, not all dust is visible. Mr. Pentz lost half of his lung capacity due to invisible dust. Fortunately for the rest of us, however, Bill Pentz shares his extensive dust collecting research to help woodworkers learn from his mistakes. It’s a testimony to how much there is to know about dust collection system design. The first thing to know about dust collection system design is the different types of dust you’ll encounter in a woodworking environment. Wood chips are the largest and most easily noticeable. A broom and dustpan is all that’s required to clean up the largest woodworking debris you’ll encounter. Sawdust and leftovers from your sanders, planers, and lathes are the next most common type of dust you’ll have to deal with. It’s finer than wood chips, and it’s also everywhere. You might need to use a shop-vac to clean up some of your sawdust piles. The fine dust is what really makes a dust collection system design mandatory. Out of sight often means out of mind. Just because you can’t see it, doesn’t mean it’s not there. Now let’s look at some common dust collection system designs, to help you figure out which dust collection basics will work best for your needs. Dust collection basics run from utterly simple to almost infinitely complex. You’ll still need a broom, dustpan, and shop vac. You just won’t need to use them as much when your filtration system is fully in place. Your shop vac is still the first line of defense when it comes to keeping your workshop dust-free. A shop vac is your go-to for eliminating larger piles of sawdust and debris. It’s also one of the most affordable tools in your dust collection system design. Shop vacs usually run for less than $100. You’ll use it every day, for everything. If you don’t already have a shop vac, save yourself some pain and suffering and get one now! A single stage dust collection system collects all of the debris in filtration bags. It’s useful for collecting large debris but falls short when it comes to fine dust. Because the air isn’t filtered, lit lets the dust back out into the atmosphere. Getting a finer mesh bag will help prevent fine dust and debris from entering the air you breathe. Use a .3 micron debris bag to stop silt-like fine dust from escaping. Make sure to have bags on the top and bottom, as well. Otherwise, you might not get suitable air flow. A double stage dust collection system is known as a “cyclone dust collection system.” It uses extreme speed and force to separate wood chips and dust from the finer debris. The first stage spins the wood chips and debris using a strong blast of air. This air is sucked down a thin funnel, which is why it’s called a cyclone. The air slows as it descends, depositing the wood chips and dust into the lower bag. The air then passes through a fan, to further separate physical debris. Then the air passes through yet another filter, which catches the remaining fine air pollutants. The good news is that the second filter doesn’t get a lot of wear-and-tear, as the first stage of filtration catches most of the detritus. Remember to keep an eye on the bags for rips and tears, or the dust could re-enter the air. There are many different kinds of cyclone dust collectors. There’s a certain amount of controversy between which one’s the best. Like most tools, “the best dust collection basics” will be the one that best suits your need. Many prefer the tall, skinny models, which do a good job removing the larger debris. These models can be too tall for certain workshops. There are smaller, more circular designs that look impressive, as you can watch the wood chips and dust piles fall into the bottom chamber. The right dust collection system design will improve your workshop in every way. It’ll make your shop more productive while also ensuring your workers (and yourself) are safe, happy, and healthy! Want To Find Out How a Dust Filtration System Can Help Your Shop? We’ve got fine dust collectors for shops of every size! Whether you’re a hobbyist or full-time woodworker, our fabric filters have got you covered! Find out more about our fabric filtration system, and contact us today with any questions.